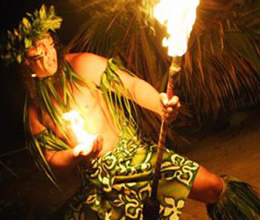 Immerse yourself in Hawaiian culture at one of these fabulous Oahu island luaus. 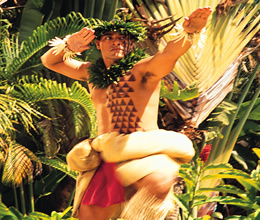 Sample authentic Hawaiian foods, watch or participate in time-honored arts & crafts and cultural demonstrations and enjoy island-style entertainment with music and dances from Hawaii and greater Polynesia. All this and more represents a traditional Hawaiian luau feast that is just too good to be missed! 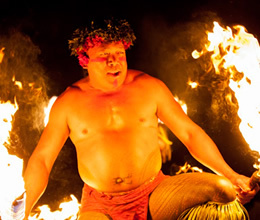 Several authentic Hawaiian luaus are offered on the island of Oahu. What all of them have in common is a great selection of tasty foods. Try popular luau delicacies, including kalua pua'a (roast pig), island fish and lomi lomi salmon, or savor all-time continental favorites, such as chicken, prime rib and vegetable dishes. 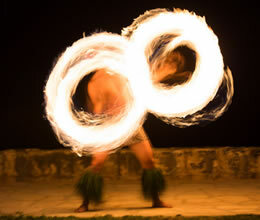 In addition to the big luau feast, another highlight of the evening’s festivities is a Polynesian show featuring Hawaiian hula dances, warrior dances from Aotearoa and the breathtaking Samoan fire-knife dance. Make your selection from these top Oahu luaus above and reserve your seats early. Hawaiian luaus tend to sell out quickly because they are so popular. 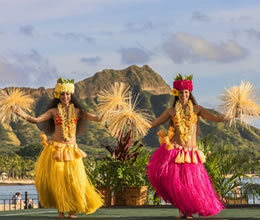 OahuLuau.info offers the best prices on all Oahu luaus! For more information or to make a reservation, call Toll Free at 1-866-482-9775.